Another Coen Brothers movie, The Hudsucker Proxy is all 50s glamour, but the characters are really cartoon creations, and I didn't feel for them. Which is my criteria for a good movie or book - do I care what's going to happen to the people in it? 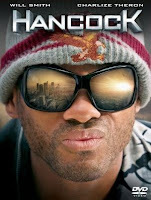 So, despite the high production quality, and the good actors, this one doesn't get my thumbs up, I'm afraid. PS: yes, we're watching a lot of movies on the telly these days! Completely enjoyable, this Hellboy II. Not quite the movie of the year, but good fun all the same. He's a mutant, or a creature with super-powers - he's red, he's got big arms and horns, that he files down meticulously, and he's very strong. And he likes cats (no, he doesn't eat them). He's part of a Government agency full of mutants. Some weirder than others. An ancient pact between humans and a race of elves (or at least people who look like the elves in Lord of the Rings) is about to be broken, with dire consequences. The evil prince must be stopped at all cost. And the evil prince has got a goody-goody twin sister. Have I lost you yet? There is a lot going on here. And I actually remember more than I thought - all of this without the help of Wikipedia! And I also remember that one of the final scenes is a hand to hand fight over a big clockworks mechanism, and the twin sister is very significant. Perfect for a wet Sunday afternoon. Probably a big hit with teenage boys. 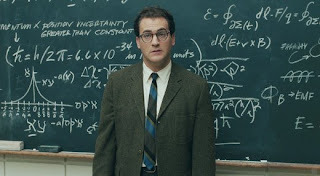 A Coen brothers' movie, A Serious Man was weirder than their usual stuff. Good, though. I'm not sure I got all the Jewish humour, but I got some at least. It's the story of how an old curse can go a long way in ruining a man's life.Or maybe it has nothing to do with it? In the 1960s, Larry Gopnik's life starts to fall apart from the moment his wife asks him for a divorce, completely out of the blue, from his perspective, at least. Or did it all start when Dora killed a man, or was it an evil spirit, in the early years of the 20th century? My nails are back to normal now, but I had a couple of weeks after the removal of the Shellac polish when they were extremely brittle. I had to cut them really short to stop them from splitting. Conclusion? Yes, I would go for Shellac again for a special occasion, as they make the nails look spectacular, but I wouldn't use it on a continual basis. I was making great progress with this one, but one of my petals is too dark. That's the problem when working from a photograph only - the shadows are very dark, and you should adjust your painting accordingly. I knew that, but I still didn't! I think I'll have another go at it! Bill Bryson's books are highly entertaining. 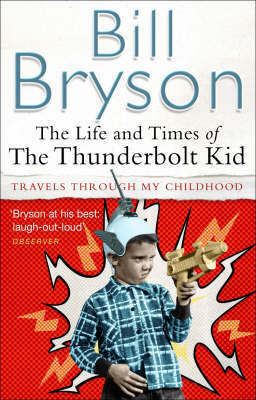 His latest, The Thunderbolt Kid, in which he tells of his childhood in middle America, is no exception. But, unfortunately, I also found it highly forgettable. While every page made me smile, the previous page was quickly disappearing from my memory. And I don't think it's a sign of Alzheimer's early onset. I just think the book lacked something, call it substance, call it depth, I'm not sure. It just didn't seem to matter so much. 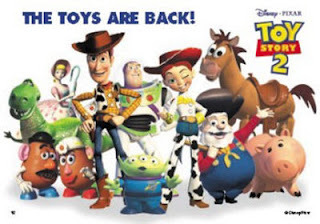 Toy Story 3 is the latest installment in the series, and we found it as entertaining as the previous movies. It's basically what happens when the kids grow up and the old favourite toys are discarded - attic or donation to daycare? Which fate would you prefer if you were a toy? We also happened to see Toy Story 2 a few weeks later, and we found how Woody's girlfriend, Jessie, and his favourite horse, Bullseye, became part of the pack! 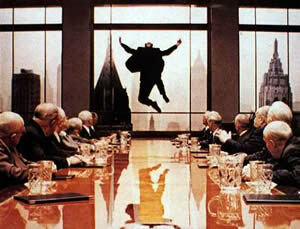 Great entertainment - no need for a kid in the room to enjoy these movies. PS. 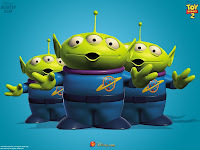 I love the little aliens! Cate Blanchett as Elizabeth. I have to say I preferred Helen Mirren. Not that Cate Blanchett is not a good actress (She got an Academy Award nomination for Best Actress for this, apparently). She is a great actress, but I felt this movie didn't have the oomph of the one with Helen Mirren. 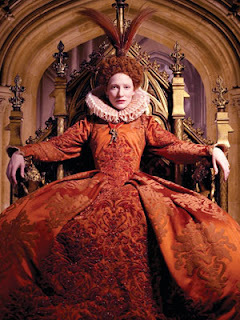 The costumes were great (and they got an Academy Award for Best Costume Design, not surprisingly). Love the Art Academy program on my Nintendo DS. Great step-by-step instructions. Well-designed tools. The only thing that doesn't make sense is that you can't export your drawings and paintings. Crazy or what? 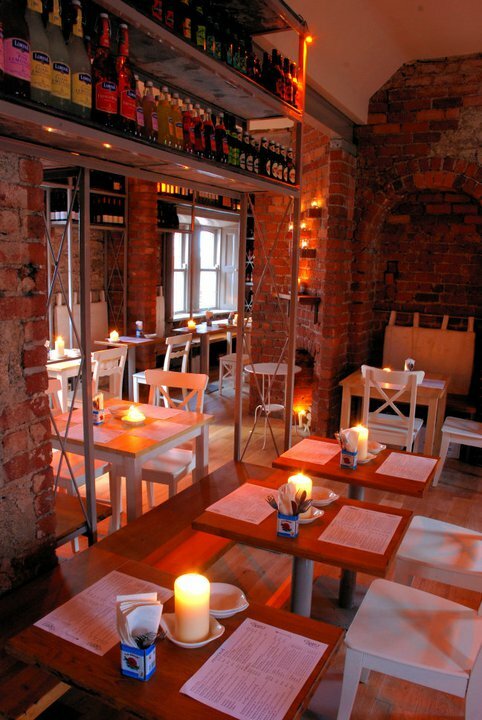 We discovered The Port House Ibericos in Dundrum Town Centre a couple of months back. Dolores had mentioned it to me one day at the gym and we decided to try it one late afternoon. It's situated in the "Pembroke Cottages", across from Hamleys. They've knocked together two of the old buildings, and it's all exposed brick inside, and quite cosy, if a bit cramped if you get one of the really small tables for two. It's essentially a tapas bar, though I have to say we didn't try the wine. But the food is good - perfect if you want a light lunch or an early dinner but you don't want to feel too full afterwards. We enjoyed the spanish omelette, sardines on a nice chunk of toasted bread, chickpeas with black pudding, fried potato cubes with "mojo" sauce, and - the best part to my mind - a platter of Spanish cheeses with olives, grapes, honey and quince jelly. There was a great buzz about the place.We tried to go back there one evening, but we couldn't get a table. I'd say it would be the perfect place to meet a few friends over a glass of wine. PS: picked up the pictures from their Facebook page, which they need to update - their last post was in January. Maybe they're too busy! We watched Hancock on the telly a little while back. Not the most intellectual film of the year, but good fun all the same. Hancock is the one and only superhero in the world - a job he doesn't enjoy. He drinks too much, destroys more or less everything around him each time he saves the world, and is resentful of people's complaints and anger at him. One day, he saves the life of a marketing guy, who, in return, offers to help him change his image. But the guy's wife is not so happy about Hancock flying into their lives. Not a movie that will get you thinking about life, the world and everything, but an entertaining way to spend an evening all the same. I thought that Charlize Theron was quite good in it. Had a Spa day with a friend yesterday. 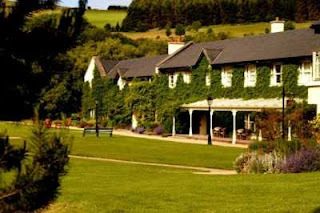 We decided to pamper ourselves at The Wells Spa at the Brooklodge hotel in Macreddin Village in Co. Wicklow. We couldn't have picked a better day for it. Pure blue skies the whole day added to the holiday feeling. We had chosen the Brooklodge hotel purely based on the website. Neither of us had heard of it before, except for the Strawberry Tree restaurant, which apparently has got quite a good reputation. Our treatments were excellent - I had a back massage and a foot massage in the morning and a facial (which included a back massage and an arm massage) in the afternoon. The treatment rooms were cosy, if a little dark, perfect temperature, and there was even an electric blanket to keep you warm! The therapists were very good, friendly, discreet, and with a soft/strong touch. Perfect for the job. The products they use are Decléor, which I like a lot. After our treatments, we were given a glass of water and taken into the "chill room", a quiet warm spot with loungers, blankets, candles and soft music. We nearly fell asleep after our facials in the afternoon. They even had individual headphones, just in case there was a gang of ladies chatting (which there wasn't) and you wanted peace and quiet. Nice touch. We made use of the pool area after our morning treatments - the pool isn't big, but it's very nice - there are various areas where you can enjoy bubbles of all sorts. We tried the steam room - small but very comfortable, followed by a cold shower. 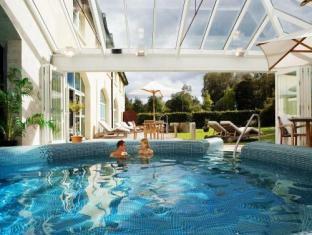 There is also a sauna, jacuzzi, outdoors hot tub, heated seats and a floatation room. So much to do. We couldn't try it all, as lunch was awaiting us. I had a prawn cocktail open sandwich with a salad and fried sweet potatoes, followed by a chocolate fondant, vanilla ice-cream and chocolate sauce. My friend had the crab claws and a big slice of apple pie! All declared yummy. The food was served in a conservatory, and we even got to sit outdoors for a little while, as the sun was beaming down on us. While the changing room and shower area is quite small, it was clean, with individual lockers. The setting of the hotel in the middle of the mountains is absolutely gorgeous. When you come in, there is a big floppy dog sleeping around the foyer, a cat lurking in the gardens and a few hens hanging about the back. With the sunshine, it all looked beautiful. We had a lovely day. It wasn't cheap, but the service was excellent, except at the end, when I asked the lady at the spa reception if she had any gift bag or samples (I had bought a couple of expensive products after all, and there was a poster in the changing rooms advertising a gift bag with Decléor oils or other Decléor products), and she made me feel like I was beeing naughty for asking. When I said to her that I just love the goodies, her reply was an egnimatic "Don't we all", and she then moved on to another customer. It didn't spoil my day, but I probably won't be hurrying back. Weird movie, this one. 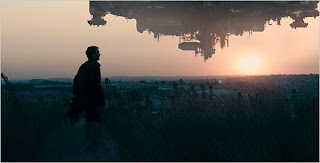 District 9 is presented like a fly-on-the-wall documentary of a team of South African civil servants whose job it is to serve eviction orders to aliens who've been living in a ghetto since they crash-landed on earth. Their spaceship is still hanging in mid-air above the city, but they have lost the ability to fly it. The aliens, called "prawns" because of their looks, have been reproducing fast, and the South African government has decided that it's time to move them on, as they want to reclaim the land in Johannesburg. The man in charge is Wikus van de Merwe, a lowly official, delighted to be given this important job by his father-in-law, not realising that he's being sent on a lose-lose mission. One thing that humans have been puzzling about since the aliens landed is how to use the aliens' powerful weapons. It would appear that only alien DNA can activate these. The Nigerian gangsters based in the area have managed to get their hands on some of those big guns, but can't operate them either. So, what happens when Wikus van de Merwe becomes infected with alien DNA? Well, you'll have to watch the movie to find out. I've already told you too much. Great story. Plenty of action. Lots of humor. Plenty of political-incorrectness. And the human/alien themes of fairness, exploitation, segregation, and doing what's right for a fellow creature. If you want actual information about the movie, Wikipedia is the place to go as the official sites are busy pretending this is all real (it's a whole world all of its own), in keeping with the movie of course, but don't give much practical information. Something I rarely do is buy flowers. But they had these lovely little daffodils in M&S for just €1.49, and they were sitting at the tills shouting "Buy Me Buy Me". I couldn't resist. Who can resist daffodils? And I was inspired by Ruth Harris, a watercolour artist who paints lovely flowers. Mine are not quite as delicate. I didn't even look at shadows, let alone delicate shades. But this is only my first attempt, and I'll have used plenty more yellow paint before I'm done with this one! We watched She's Out of My League some time back in January I think. I hadn't heard about it beforehand, but Brendan had taped it, thinking it might be a good movie for me. And it was - great fun. Basic story: Loser geek falls for gorgeous successful girl, and keeps on thinking she's going to dump him because he's not good enough for her. And she does. But then, maybe not. I find that it's hard to find a good rom com nowadays. Nobody has done anything as good as Pretty Woman or When Harry Met Sally in years. Not that this movie is quite in the same league (partdon the pun). But it was fun and witty and it made me laugh. That's all I want. 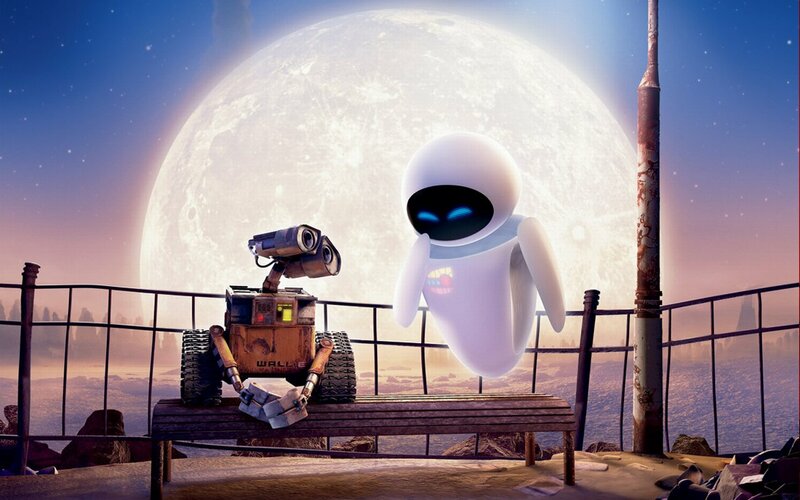 We started watching Wall-E with Philip a couple of months ago. After he was gone, we decided that we'd watch the end of it ourselves. OK, it's a kids' movie, but that doesn't mean we can't enjoy it. It's a story of friendship and hope. Definitely a feel-good movie. And of course, there are the games on the website - I particularly enjoyed the Trash Tower game, though I'm not very good at it. Poor cockroach Hal got fried a few times. It's that time of the year again - lambing season in Airfield. It was a cold morning, but we were well wrapped up. 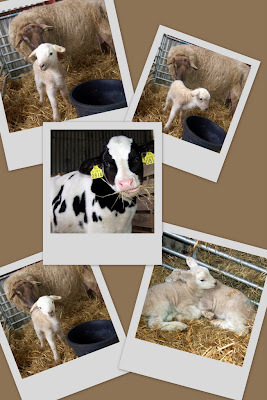 The lambs are only a few days old, so they're not allowed out in the fields yet. All the better for us to have a close look at them. And the calves were gorgeous too. And of course, the sun came out as soon as we got home. Typical. 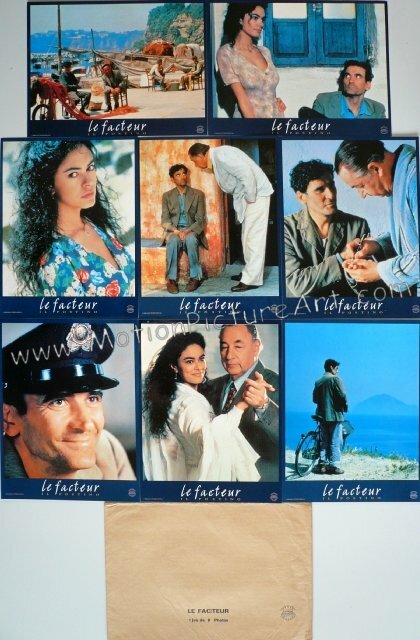 Lucinda gave us a loan on the DVD for Il Postino last December or was it January? I'm now a bit vague on detail, but it was a lovely story, beautifully shot. The story of a young man on a small island in Italy (or was it Greece?). He gets a job as a postman and his only customer is a South American communist and poet (played by Philippe Noiret) living in exile there with his wife. The postman wants to learn poetry so he can seduce the girl of his dreams. Well, it works and they get married. But I won't tell you more. 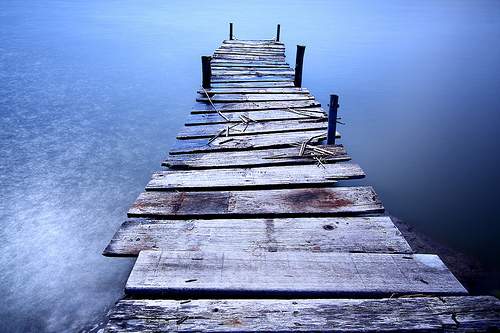 It's a slow-paced story, of a simple world that becomes more complicated as the years go by. Amazing shot - amazing location. Hang En Cave, Vietnam. Here is my latest interpretation of this lovely scenery! Much more realistic than my previous attempts. I moved the rocks around and I gave the 4 mountains in the back more prominence. And I think I managed to create convincing grasses. The only thing I'd change here would be to move the big rock further up the picture slightly so it overlaps the rusty background. That way, it would stand out better. I'm not sure if I'll have the patience to paint this scene again, though. (There is an intermediary version that's too ugly to display here. Suffice to say that I very nearly lost heart with that one - I had used the wrong colours. Here I used a middle orange and cerulean blue as my main hues). As you all know, I'm very fond of my iPad. And I like to read books. So the Kindle iPad App is the perfect tool for me. I only found out about it a couple of weeks ago, when reading an artice about possible legal battles between Apple an Sony over the Sony ebooks. I've downloaded a few books. It's so easy - literally one-click from the Amazon website. But note you have to go to www.amazon.com, as www.amazon.co.uk won't deliver ebooks to Ireland. Go figure?. These books will come in handy the next time I'm flying Ryanair - I won't have to make hard choices about which books to bring and which to leave behind. I even got an art instruction book, complete with colour pictures. It's called Powerful Watercolour Landscapes by Catherine Gill. I'm learning plenty. I have to say I love it so much that I've added the Hardback version to my Amazon Wish List! Hopefully the legal battles will get settled and I'll be able to continue using my iPad for reading - though I have to admit it doesn't fit in the hand quite as nicely as a Kindle. Simple but elegant black dress with striking silver necklace for Evelyn last week. PS: an "Anonymous" commenter thought that Evelyn isn't a good weather presenter. I published his/her comment all right, but I couldn't disagree more. I think she does a fine job, and her warm smile at the end of the weather always cheers me up! I know "brown dress" sounds awful, but it's a very classy number that Siobhan wears with minimal jewellery to complement it. But I keep missing it on the RTE Player - I should have gone to the site straight away. I'm falling way behind in my reviews, or maybe I've been watching so much good stuff on the telly that it's hard to keep up. 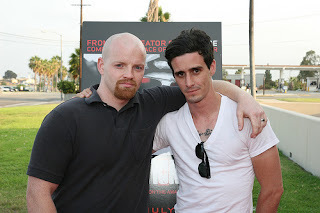 Generation Kill is a DVD set I got Brendan for Christmas, and we watched it in the early weeks of January. And now we're in March, and I'm finally sitting down to review it. It's the story of a platoon of Marines during the invasion of Iraq and the toppling of Saddam Hussein. Not sure if "platoon" is the right technical term. Maybe it's a "company". You see, I knew all the technical terms when we were watching it, but now it's all a bit vague (There was a nice feature on the DVD by which you could pause, and display a glossary of terms, a summary of the various characters and their position in the chain of command). But, never fear, if you want all the jargon, there is a section of the website dedicated to the Linguo. Very good story, great characters, and the amazing thing is that it's all true. A journalist from Rolling Stone is embedded with the platoon and the series is based on his book, an account of what he saw and heard during his time with the battalion. One of the features on the set is an interview of the actual soldiers whose story this is. Most of them are not in the army any more, one of them is now working in Hollywood and he actually plays himself, which is a bit weird! The main guy, Brad Colbert, is played by Eric from True Blood. 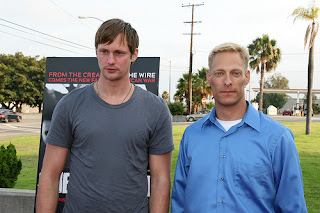 That is to say, it's played by the actor called Alexander Skarsgard, a tall and handsome young man of Nordic extraction (he's Swedish, actually!). And he does look a lot like the real Brad Colbert. Well, maybe not so much in actual looks (and the picture here doesn't do him any justice - he must have been filming True Blood at the time this photo was taken! ), but in his demeanour, his way of talking, cool under all circumstances, and ever the gentleman. Quite a different persona from Eric! Some great characters, and also good story lines, showing the contrast between the dedication & professionalism of most ordinary marines (although there are also some looneys in there) and the incompetence of some of the commanding officers. And if, like me, you're squeamish, be warned that there are some gruesome scenes. This is war after all. But all the main characters come out of it alive. Maybe I shouldn't have told you this - half the tension in the story is whether or not they will survive, but, once you start watching, you'll have forgotten this blog after 5 minutes.